He can't be a dog. He drives a car and wears a hat. Did Lardass have to pay to get in the contest? I don't really like this movie! I am generally bored with boys coming-of-age stories and the last part - "I never had any friends later on like the ones I had when I was twelve. Jesus, does anyone?" - just makes me roll my eyes. But there are so many gratifying little bits to the movie, the pie-eating contest, the constant looming threat of trains, the natural chatter between the foursome....I still find myself enjoying a lot of it. It's definitely a movie that feels like it was conceived of to be Important from the beginning and never really bothered to earn it, so it's definitely pretty eye rolly. That line about your friends when you're 12 is both kind of nauseating and untrue for lots of people who had mediocre friends when they were 12. * The best parts are the little moments that aren't about Growing Up, the ones troika mentions, which are genuinely funny and enjoyable. I think I would have enjoyed the story of those boys taking a random camping trip where no one learns anything about themselves or deals with death a lot better. That said, a great performance for the four young actors. They carry the movie incredibly well for kids their age. It might be the best acting performance I've ever seen Wil Wheaton give, which isn't just a knock on Wesley. *Other Robbie, I'm looking at you. Only one Goonie though, that seems like a glitch. And here's where we take a moment to honor Frances Lee McCain for playing the most moms in well-remembered 80s movies. Cue montage: Real Life (1979, but I'm still counting it), Footloose, Back to the Future, Gremlins, Stand By Me...Then Scream in 1996 (again: still counting it). I love this movie; they really lucked out with the child actors. River Phoenix as Chris is the stand-out for me: he gets a lot of big moments to play (the milk money; "your friends drag you down") and he's always utterly convincing. The weakness I think is that Gordie -- especially the adult Gordie -- is very obviously a Mary Sue for Stephen King. The coda always feels like King tapping you on the shoulder to say "hey look, I had it hard too but look at me now." I just started re-reading The Stand and it struck me that the chapter that introduces Stu Redman has a lot of the same themes of "it's hard to escape your small town upbringing" that are explored in more depth in The Body / Stand By Me. Also, the reveal of Chris's fate is a really cruel sucker-punch. The movie sets you up for a happy "aww, so Chris made it after all" ending and then yanks the rug out from under you, leaving you with only Smug Richard Dreyfuss and his Big Clunky PC. Would the movie would be better without the Dreyfuss bookends? I think probably yes. I was looking at some old Wil Wheaton stuff about working on the movie, and he pointed out that the four child actors actually ended up having careers that vaguely match their characters' fates. River died young, Jerry found steady but unspectacular work that set him up comfortably enough, Corey bounced around and struggled with some pretty heavy stuff but ended up scraping by, and Wil is a writer (among other things). I'm sure you could probably play that game with some of the roles switched around, but I think it does show how well the kids were cast. It's also pretty surprising that so many of the child and teenage actors had long (or at least noteworthy) careers outside of this movie. I feel like with movies that have big groups of kids, there's always a few who kept working, but usually not so many that are as or more notable for their later work. I was hiking in Maine this past weekend and we came to a mountain pond (The Bowl, in Acadia NP) where we went swimming. You could see leaches swimming around in the water so I made damn sure not to stay still in one place for very long, and even still when i got out I checked myself all over, even down my pants. Thank you, Stand By Me, for giving me yet another thing to be terrified of. I enjoyed this movie a lot as a 12 year old and never wanted to see it again -- even then, I was pretty sure it was meant to be deep for a younger generation -- and the adult in me would just pick it apart! I just watched it for the first time with my 11-year-old nephew. Smoking scene!! gulp. He loved it and I thought the dialog was just so true. I actually really enjoyed it! I think a lot of it as Bulgaroktonos mentions was the casting. The kids really sold it. I thought Chris's death seemed gratuitous and it turned out per Wikipedia that the novel's ending had everyone except Gordie dying young, so I guess Reiner did what he could. I'm inclined to agree, not only because as multiple people have previously mentioned in this thread the ending sentences of Gordie's novel kind of cheapen the whole thing but also because how the hell did Gordie know what Eyeball & co. were up to during 90% of the movie? Oh, and thumbs up for "bulltrue" tag, troika. I don't really like this movie! I am generally bored with boys coming-of-age stories and the last part - "I never had any friends later on like the ones I had when I was twelve. Jesus, does anyone?" - just makes me roll my eyes. You just dissed the most awesome moment in a film chock full of awesome moments and couldn't be awesomer. Are you peeps eating a bowl of sour grapes while watching this movie? troika - I got you a present. Do you like it? 1) Richard Dreyfus bookends: absolutely love, a good call that eases the viewer into the story. Would not cut! 2) No one is mentioning the soundtrack? Lollypop, lollypop, oh lolly-lollypop! The title song, of course, which is a wonderful use of a standard. 3) The "I never had any friends later on like the ones I had when I was twelve" isn't saying that you don't have meaningful friendships later in life, it's just saying that for simplicity, wonder, thrills, intensity of bonds, loyalty, and bonding - the friendships forged at that age are peak experiences, in a way. - There is a Twitter account if you're into this movie. - Andy Lindberg (aka "Lardass") has a Twitter account. "Rob Reiner developed a good working relationship with Stephen King after this movie, so much so that King only agreed to sell the film rights to Misery (1990) if Reiner directed the film. Reiner's production company, Castle Rock Entertainment, also went on to produce several other adaptations of King's stories. In addition, John Cusack went on to appear in the film 1408 (2007), and Kiefer Sutherland's father Donald Sutherland appeared in "Salem's Lot (2004)(TV)'." "The actress pictured on the cover of a vintage movie magazine is Elizabeth McGovern, who was at the time engaged to director Rob Reiner." "Corey Feldman and director Rob Reiner tested thirty different laughs before deciding upon the one for Teddy Duchamp. The laugh happens to be similar to that described in King's story." "River Phoenix, Corey Feldman, Wil Wheaton and Jerry O'Connell got up to much mischief in the hotel they were staying in during filming. This included throwing all the pool side furniture into the pool, Wheaton fixing video games in the lobby so they could play them for free and Phoenix (spurred on by the other boys) unknowingly covering Kiefer Sutherland's car in mud; only discovering whose car it was when Sutherland confronted a scared and nervous Phoenix about it later." That's a good way to put it. I love the movie, but that's a fair criticism. HOWEVER does the crappy effects in the puking scene bother anyone? Excusable, I think, because really what we're seeing there is the boys' imagination of Gordie's story. So of course it's ridiculous and exaggerated and gross; they're twelve. I was happy with it since it made me able to watch the scene without feeling queasy myself. I feel like that could have easily been deliberate. Yes! Since the first time I saw it in 1986ish. Well I wouldn't say it bothered me, but it was a bad effect that stuck in my brain and is something I often think about whenever I see vomit scenes in movies, the way I'll always just mentally see that weak transition from fake Ian Holm head to real Ian Holm head in Alien whenever there's a talking severed head thing going on. 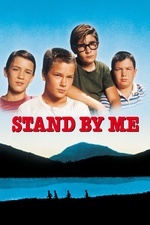 I watched Stand By Me again recently for the first time since the 80s (SO hadn't seen it and wanted to). Soooo much schmaltz. I still like it as a road trip story, and it has that feeling of verisimilitude to human nature that Stephen King stories can have. Back then I think I liked it mostly because it seemed like one of the only portrayal of a fat kid as the hero of anything, even if just for a story in a story. Yup, indeed, he almost cast her as "Sally" (yes, that Sally). But they broke up. Unless that's about the magazine prop itself. It's visible on a shelf in the store as the camera pans; I don't recall it being handled by any characters, though. Herve Attia has a revisited locations video (best part, naturally, is when he digitally inserts himself into the trestle sequence). You can see the store (but not the magazine rack) at about 5:35 in. I skipped through all the bits of the railroad, most of which is now a bike path (the trestle, incidentally, is an entirely different location near the California state line, but also no longer a working railroad). Even the shots of the town get a little repetitive, actually.